Pork ear shells are a natural dog snack, ideal for peckish times between meals. Oven-dried, unseasoned. Very good product :"Excellent product. Doesn't smell bad. My four Chihuahuas love them. My dogs spend a very long time munching on these pig ears. They take so long for them to eat these ears that there is no resource gu"
Delivery in 1-5 working days ...more All prices include tax., Additional shipping costs may apply. 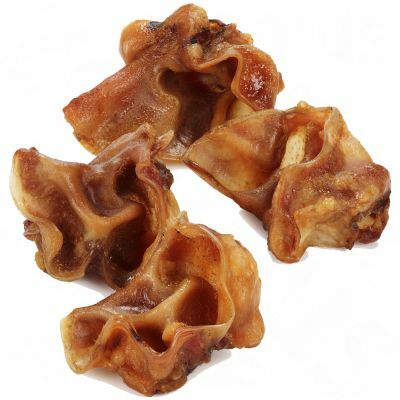 Pig Ear Auricles are a yummy dried dog snack that makes the ideal treat between meals. Dogs of all breeds just love them for their intense aroma. Oven-dried at 130°C, smoke-free. Unseasoned. Exclusively from German animals. My dogs like these but they are very greasy, which I don’t like. I almost feel I need to keep them in the fridge. I bought a large pack but am going to I’ve the majority of them away. They are not a chew, i thought they may last a little while but they are gone in a moment or two, and they then want another! 3 Of my dogs are litte dogs, and its still gone in a short time, and the collie uses them like dog choccies more or less. I will buy them again as they like them so much, but they give one of my dogs a upset tummy if he has more than one, as they are greasy and rich. My rescue greyhound thought he'd died and gone to heaven when he crunched his first auricle. But he soon returned to the living and came to scrounge another! He could happily live on these and pigs' ears but being a big dog with a long, well equipped mouth, they don't last long. Sadly, he doesn't savour them but puts in a supreme effort to get on the outside of these treats as quickly as canine-ly possible. Beware of giving seconds as that immediately becomes the norm. My dogs love them, and so does my wallet, the last 5kg bag lasted about 5 months with 2 dogs having one each most days, which doesn't seem too bad at all. This 2nd bag is a 5* product, but I've had to knock 1 off as the 1st bag was maybe 10% snouts and not ears so consistency could be an issue. These things stink before you even open the bag, so before you buy, you might want to consider getting an airtight container (I use a 30ltr one which is only slightly larger than needed). My terrier cross loves these, and there is plenty of crunch to keep her occupied. The smell isnt great for a human but not anywhere near as bad or as potent as dried tripe / pizzles. My German Wirehaired Pointers love these. 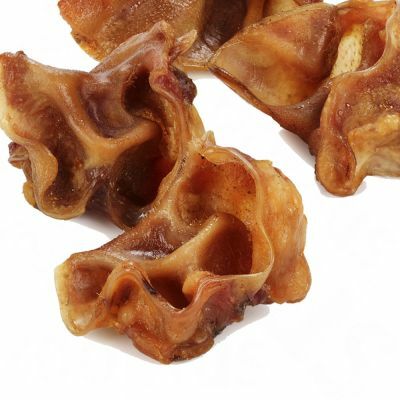 These snacks are crunchier than pigs ears and are smaller so my dogs can have one each day. my golden retriever loves this ones. it is the best treats for him. worth try it. These are AMAZING value. In supermarkets you pay around £3 for 4 pigs ears. You get a huge amount in a kilo and my dog loves them. So does his best mate Dave. Everytime we go across to see him Dave looks for his treat as well. My GSP eats these in very little time. But she loves them. You get a big bag for your money. Fantastic value compared to whole pigs ears. Perfect treat for my two! Whilst my Great Dane may see these away very quickly, he loves them, they are a great treat for him and I can tell for him they are tasty! My young Weimeraner loves them too. Ideal chewing treat, good price and I can order lots of them. I store them in a sealed bag as they can be smelly but for my boys I don't mind! My two german shepherds love it! I will buy it again! My Springers love these - you can set your watch each evening as they wait for them to be given out as a treat! ...in the house we certainly know how to road test a treat. And boy, do these treats ever go down well! As a lunchtime snack everyone runs for their beds (or sofas) and munches as fast as they can in the hope that they will get another! Excellent value for money, good entertainment and the fat and oils seem to do their coats good too.